Could we accidentally bestow human-style awareness into a pig? 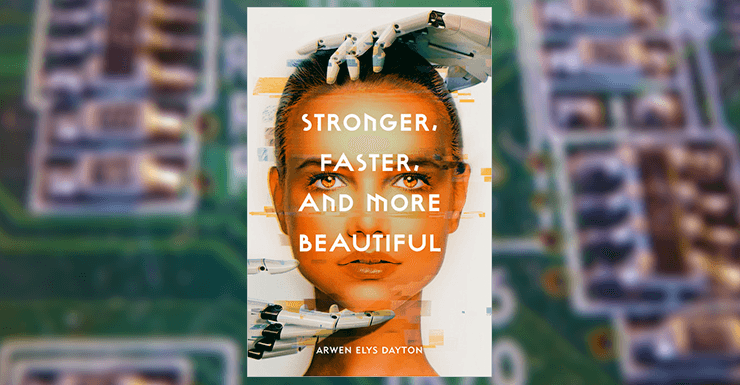 My new book is called Stronger, Faster, and More Beautiful, and it's a fictional look at human genetic modification in the near and distant future. The book is told through six interconnected stories, each exploring a different aspect of our future world and the evolving face of humankind. As a novelist, my central concern was this: What will it be like to grow up, to fall in and out of love, to discover who you are, when the very essence of "you" might be changing? Pulling this off with any degree of authenticity, though, required lots of research into the current state of bioscience. That research changed the way I think about our species and our world. Maybe you’re already staying fully up to date with the gene editing tool known as CRISPR or the many initiatives to extend human life or the plan to release thousands of genetically modified mice onto Martha's Vineyard or...well, too many other examples to list here. But if not, please allow me to share just a few of the science fictional themes I explored and the real-world advances—advances that would have been pure fiction only a few years ago—that now lie almost within our scientific grasp. Early in my book, semi-identical twins are dying of organ failure. When one lapses into a vegetative state, the decision is made to harvest the healthy tissue of her organs to rebuild her brother's and give him a chance at life. This is an only-slightly-exaggerated example of present-day medical dilemmas around organ donations and searches for compatible bone marrow, and it lead me to ask what other life-saving contributions one person may someday be able to give another. Enter Alex Marson, a geneticist and immunologist at the University of California, San Francisco and the Scientific Director of Biomedicine at Innovative Genomics Institute. In Marson's lab, researchers are making genetic modifications to human immune cells to turn them into specialized weapons against disease. In the beginning, such therapies may have to be done manually for each patient—harvesting immune cells from their blood, altering them, then infusing them back into their bodies. But, Marson tells me, "The thing that has become clear, and where research has opened up a new way of imagining how to treat disease, is that these genetically modified immune cells could themselves become drugs." He envisions, eventually, an "off the shelf" product -- cells harvested from a human, edited, then grown by the billions in a lab, in a format that could be tolerated by anyone. "Not a pill, not an injection, but an infusion of a living drug of cells that have been genetically reprogrammed to have a therapeutic property," he tells me. "They would go into the body programmed to fight a specific type of disease -- that could be cancer, that could be an autoimmune disease, it could be an infection, it could be other classes of disease that we’re just starting to imagine." I would have been fired from my job as a science fiction author if my next question hadn't been, "What sort of diseases are you just starting to imagine?" He doesn't mean anything "science-fictiony," however. He's talking about cardiovascular and neurodegenerative diseases, and though he is quick to point out that we are now stepping into speculation, he leaves me with an image of edited human immune cells in IV bags, being infused into arteries and brains, where they chip away, molecule by molecule, at the plaques that destroy minds and stop hearts. Later in my book, and a bit further into the future, we meet a young man who is the failed result of clever tinkering at the embryo stage -- a designer baby whose design didn't go to plan. Frightened that their son would be out-learned and out-performed without certain neural upgrades, the boy's parents end up with a misshapen child of exceeding intelligence and little to no interest in other humans. I have three teenagers (which is, by the way, an efficient scientific method of proving that you are not, in any sense of the word, "cool"), and I viscerally understand the urge to make things perfect for our children -- or at least to remove whatever hazards we can. "The oldest designer baby is six years old now," Kevin Esvelt, of MIT Media Lab, tells me, when our wide-ranging conversation strays onto the subject of editing humans. Esvelt is a CRISPR pioneer whose area of expertise at MIT is "sculpting evolution." He is, among other undertakings, spearheading a project to release thousands of lab-bred mice -- mice modified so that Lyme ticks cannot attach to them -- onto Martha's Vineyard and Nantucket. Though he tells me with a laugh that his lab "doesn’t do anything in humans, because that’s controversial," he naturally keeps a close eye on lines of research being pursued by others. He explains to me that parents of this first "designer child" made forty embryos by IVF and genetically sequenced all of them. They were able to exclude the embryos that carried problematic mutations and implant the one with the highest likelihood of physical health. No editing, per se, but rather the genetic equivalent of panning for gold. That intense sort of screening is becoming increasingly common, but to get rid of inherited diseases, I ask, won't we soon be editing our children's DNA directly? I point to a study done in China last year in which the researchers attempted to edit out of human embryos the mutation that causes the blood disorder beta thalassemia. Both Marson and Esvelt contend, however, that this does not mean that we should be editing human embryos. "People assume that edited humans will be made by doing it the way we make edited mice or rats or pigs or whatever," Esvelt explains. "You take a fertilized egg, a zygote, and you inject it with CRISPR and a new DNA. In reality, this is not going to happen for humans. Because not all the cells get the same edit. Pretty frequently that fertilized egg will divide -- it will replicate its DNA before editing is complete. And the result is an organism that has different edits in different tissues of its body." This kind of organism is known as a mosaic, and in fact, that is exactly what became of the embryos in that Chinese study. About 20% of their cells were edited properly. The rest...not so much. "To make a baby from something where you weren’t able to do quality control... I'm not saying no one will ever do it," Esvelt concedes. "It’s just that it would be totally unethical." “We're already studying disease genetics by making genetically modified mice and other species by modifying fertilized embryos,” Marson agrees, “and the truth is there are a lot of incorrectly edited mice." So, if you are ethical, you will not be doing gene editing on viable human embryos at this time. But... this is a philosophical argument, not a technological one; the technology is already being used. And other than publicly shaming scientists who cross ethical lines, there may be little we can do to stop its continued application. Such ethical dilemmas are the bread and butter of speculative fiction, of course: worrisome for future generations of human embryos while being extremely good for, well, the purposes of story. That same child in my novel, whose genetic editing turned out so poorly, ends up living most of his life underwater, wrangling manatees. These manatees are special: they are living organ tanks. These docile sea mammals, like the boy himself, are the property of the Blessed Cures Consortium, which raises them in a sea paddock, each one the host to a dozen human organs that will be harvested and shipped across the world to people in need of transplants. An animal that contains tissue from more than one organism is known as a "chimera," after the mythical Greek monster with a lion's head, a goat's body, and a serpent's tail. As wild as this may sound, the manatee-chimera story may be the least speculative section of my book, because there are multiple groups currently attempting to grow human-compatible (or outright human) organs inside livestock, often pigs. At the Nakauchi Lab at Stanford University, at the Salk Institute, and at biotech companies like United Therapeutics and eGenesis, competing methodologies aim for variations on the same end result -- unlimited organs for transplant on demand. Some hope to achieve this through removing a handful of pig genes that make porcine organs incompatible with humans. Others edit animal embryos to suppress growth of a particular organ, such as a pancreas. When they inject human stem cells into that embryo, the goal is that the resulting pancreas in the animal's body will contain a significant proportion of human cells, making it highly acceptable for transplant. Others are focused on editing viruses out of pig DNA so that porcine organs cannot infect their eventual recipients. This is a magnificent vision, and yet it raises some disturbing questions. If a pig embryo is given an infusion of human stem cells, which can become nearly any tissue in the animal's body, are we potentially creating animals with partial human brains? Could we accidentally bestow human-style awareness into a pig? Could human cells find their way into the sperm and egg cells of animals? And if so, what are the consequences? Such queries come up against a hard fact: over a hundred thousand people in the US alone are waiting for organ transplants at this moment. There's also, of course that other definition of "chimera": "a thing that is hoped for but in fact illusory or impossible to achieve." So even if the writer in me delights in ethical uncertainties, the human in me wants us to find acceptable answers and is waiting eagerly for the arrival of non-chimerical chimeras. For each story in Stronger, Faster, and More Beautiful, there was real-world science nipping at the heels of the fiction. Does this mean, in future books, that I will have to come up with increasingly crazy ideas to stay ahead of reality, or will I, at some inescapable event horizon, have to become an actual science writer? Hopefully not the latter, because it sounds like a lot of work. Only a few years ago, the future was comfortably familiar: it would be full of e-cigarettes and Fitbits for babies and videos of cats falling into toilets for an audience of millions. Now we are stepping into a frontier, and the future is likely to be as small as individual base pairs of DNA and as large as a whole species -- our species, probably -- changing forever.